All through rural Cádiz la cultura taurina is alive and kicking. This is bullfighting country, and August is the peak of the bullfighting season, although the first events begin as early as March, and the season lingers on through September. Village ferias that don’t include a bullfight as part of their summer festivities will at least have a corrida de toros or two. And so it is in Zahara. As part of the Annual August celebrations at the end of August, bulls . . . well, cows, but cows with attitude and enormous horns, are released into the main street to chase the local population up and down the cobbles for several hours before being taken home again in a lorry. Most people sit on, or peer through the wooden barricades erected for the occasion (from the safe side), or watch from balconies with a drink, or in the slither of shade on the church steps; but the village’s youth and those old enough to know better are in with the cows, jumping and calling to attract their attention then running fast when they do, hauling themselves up onto window ledges, or impressively vaulting the fence. Last year, I saw someone run towards a cow ‘bull’, grab hold of its horns, and somersault over its back. Free drinks all round. Best viewing point is the old men’s bar, Bar Niño, although once in, you’re trapped for the duration – not that anyone’s complaining. Twice now I’ve put out pink socks, yellow shorts and a red cape for Dave on the morning of the corrida, but so far he has hasn’t been keen to strut his stuff. This year, like every year, the celebrations included prize-giving for flamenco queens and princesses, paella, dancing until dawn to old standards played on an electronic keyboard, and a very quiet Monday. Many months ago a German drew level with us on the mountain road out of a nearby village, Montejaque – quite a feat. He kept up for several bends, and seemed to be saying something so eventually I wound down the window. Turns out one of our rear wheels was coming off. This was the start of a long, ongoing, car care program at Jose Miguel’s workshop on one of the village’s upper streets. The various jobs – adjusting the headlights to point right, not left, scraping off rust, making it go – have an interval for lunch, and, during one, Dave ambled to the far end of a dead end lane leading up from the main square and then dropping down and, on the final crag, spotted a house with a Se Vende sign. He came back very animated, and so I went with him to take a look from the outside. It looks almost Greek with its Aegean blue doors and windows, and stands on a rocky base looking out over the valley. Immediately below the terrace there are prickly pears, a small-holding and a braying donkey, and above it, a rocky hill. The fig beams of the terrace had rotted, as had one of the doors, but it still looked interesting and ergo, unaffordable. We called the agent in Ronda who told us it was a bank repossession, being sold for €35,000, which was confusing news. A bank repossession, a house that someone else had lost? But €35,000? A village house . . . but on its own facing nothing but national parkland? Montejaque . . . but near Zahara. Smallish . . . but big enough. I listed the factors for and against on my whiteboard and got on with other stuff. The idea of a house, any house, even the wrong house in the long term took root, and so with a mix of relief and resignation we toasted our decision, planned where we’d put the furniture, and decided to stick with a blue, but maybe go for a more Nordic, cooler shade, and called the agent to arrange a viewing. Different every day, but always a treat for the eyes. And only 10 years old – you touch the top of trees when you swim. This is the view from where we park the car. I’m currently living in a rented flat in olive country. If I could see through the tiled roof opposite, I’d be looking at a smooth dome with rows of olives down it, and bigger ones in all directions. Most villagers here have olivars – olive groves, and most have walked me through them in case I’d like to build a house on one. I burn olive tree off-cuts, get olives with €1 wine (glass, not bottle – that’s €2), eat cake made with olive oil and, now it’s no longer prohibitively expensive (Waitrose), douse all salads in olive oil from the local cooperative olive press. When I first saw this place it was sizzling in the heat and loud with cicadas and the villagers only came out after dark (or to swim). Even though it is now a confusing 10 degrees celsius, it still looks and feels like Southern Europe for Beginners. Up the hill behind us is another kind of country. An Alpine country. The village lies on the northern edge of the Sierra de Grazalema National Park, most of which is higher up, and constructed out of crags, gullies and giant gorges, spongy vibrant meadows and forests of pine and Spanish fir. It covers around 51,700 hectares, and is a Unesco Biosphere Reserve, famous for the big things in it, such as the highest peak in Cadiz – El Torreón, 1654m, the biggest cave system in Andalucia, a very big gorge with 400m walls, and some velociraptor-sized birds, the Griffon vultures, which soar above it in search of lost children. It also gets 2.2m of rain a year to keep it nice and damp. Wild boar, ibex and deer thrive here, as do the inhabitants of a smattering of white villages: Cortes de la Frontera, Grazalema, Montjaque, Benahoma, and El Bosque, as well as Zahara de la Sierra. Grazalema is theoretically the neighbouring village, some 350m up, and reached by zig-zagging around vertical rock faces on a buttressed road up through the Puerto de los Palomas (a Tour de Spain climb). Expect a few near misses with traffic coming the other way, slight nausea, and distracting fine views. Like most places round here it was settled by Romans, then occupied by Berber Arabs who were driven out by Christians. Quite a long time later it was sacked by Napoleonic troops, and nowadays it’s popular with tourists, local and foreign, who come here to escape from the heat in summer, marvel at the snow in winter, and hike steep, boulder strewn trails to Narnia valleys. The village has the advantage of being popular with tourists without being touristy, by which I mean people come here to see life as it is lived without wishing it were different and the menus were in English. There is accommodation, and camping (which is almost accommodation), and a tourist office, but aside from that few concessions made. Many of the German, Dutch, French and English sitting out in the plaza turn out to be residents, doing art or working remotely and living in nicely restored terraced properties with great big wooden doors and rough beams which are slightly above my price range. They tend to look pretty pleased with their lot. Anyway it is useful to have Grazalema, a quintessential mountain retreat just up there above olive country for whenever you want to feel just that little bit colder. We go up there on Sundays, along with half of Ronda – Ronda not Cwm Rondda – ostensibly to hike, but mainly to eat. You can see stuff that you don’t get to see down below like fur gilets, gloves, thermal clothing and fine blankets and capes made from wool spun in the local mill. When the sun is blindingly brilliant, the plaza and cobbled mini-square are crammed with tables, dogs, children, and people in an approximation of apres-ski wear. When the streets are in shadow, queues form for tables by the open fire inside old restaurants with stag heads mounted on the walls, and we all eat boar, venison, partridge and rabbit from thereabouts. A couple of Sundays ago we hiked from Grazalema up and around the Endrinal Valley on a walk mapped out by Tony Bishop in Walking in the Ronda Mountains. I’ve got to be honest, I chose it because it looked quick and short. It took bloody ages, and I thought I was going to be sick on the way up, but I was deliriously happy on the descent and for that I highly recommend it. Although not right now because there is snow glinting in the Pinsapar. I think it started with a picture of a derelict farmhouse in Almeria. What was standing was standing in a landscape that seemed to be made up of bits of rock and dust that had fallen off it. It was remote, and came with what looked like a quarry dotted with prickly pears and views of cardboard-coloured dusty mountains. It was available for a very reasonable £22,000. I could imagine myself sitting on the shaded deck of the minimalist pod I’d have erected beside it, sketching eagles while visiting friends, keen to work with their hands, rebuilt the walls of the old place. Then we’d all drink wine and eat olives and splash about in the infinity pool. Except there wasn’t any water. The property, one of hundreds in a similarly parlous state, wasn’t far to the east of the Tabernas Desert, Europe’s only semi-desert; a place that manages to be too hot (peaking on a regular basis just short of 50C) and too cold (substantially below freezing on winter nights) but still rather compelling. The landscape goes on and on, mesmerically repetitive, gouged by rivers that haven’t run for quite some time, and the only things moving on a still day are birds of prey, riding the thermals in a rich blue sky, and their shadows. It’s the kind of place you can imagine being staked out to music by Ennio Morricone. Sergio Leone must have thought so too; An American wild west outpost was created in Tabernas for A Fistful of Dollars, and the spaghetti western was born (although the ‘pork chop western’ would be more gastronomically correct). You can visit the Mini-Hollywood set. It’s been used a zillion times. Look out for it in The Good, the Bad, and the Ugly, For a Few Dollars More, and The Magnificent Seven, as well as great shots of the surrounding desert in Lawrence of Arabia, Indiana Jones and the Last Crusade, and most recently, the Ridley Scott epic, Exodus, slated for a December 2014 release (in which Christian Bale fresh from his success as a 70s sleazeball in American Hustle plays Moses). So, an interesting area but impractical for someone who likes a long shower. Thanks to a chain of completely random events, I am starting my meandering quest for a somewheresville in not only the wettest part of Andalucia, but the most expensive inland area. Result. 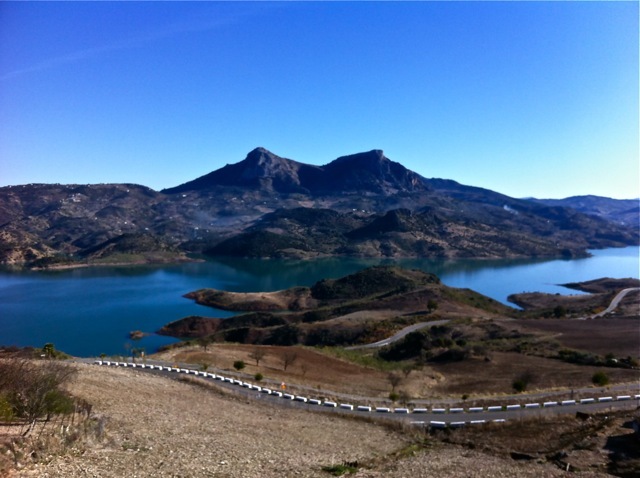 The Sierra de Grazalema, lies not far from Ronda, south of Seville in Andalucia’s southwest, the province of Cadiz. On the upside, it is a spectacularly beautiful area of lakes and mountains and white villages draped over the shoulders of a crag, the natives are friendly, the wine is good, and the walking and cycling (okay, the driving) a visual feast. I want to live here, of course I do. Who wouldn’t? From all that I have learned so far, however, this is one of the most difficult areas in which to find an affordable country house (for all sorts of reasons I’ll go on about at some length at some point). And given that it is also a National Park with strict rules regarding appropriate traditional Andalusian architecture, it is most definitely not the place to enquire about a suitable plot for a minimalist, modernist pod, even if I stress the fact it was always going to be white.